I visualized mi adidas custom soccer cleats having a look similar to the Sports Techie logo design and colors with a Team USA theme. In order to customize the cleats I used the adidas.com configurator. The first question I was asked referred to the sole. My outsole choices were: Firm Ground, Soft Ground and Hard Ground. I asked the website’s virtual customer service person which one he thought was best for both grass and turf. He said “Firm” so I went with TRAXION™ FG. The next decision to make was deciding on the shoe base color. Choices were, Black, White, Silver, Power Red, Bright Royal (Blue), Flash Pink (Purple), Flash Green, Solar Yellow, Solar Red or Flash Orange. I selected white. The next customization question drilled down on the Predator Pattern and if I wanted Regular, Camo or None. I picked Regular. Stripe color options included the entire base colors, Night Flash (Purple) and Met Gold (Brown). Solar Red was my pick. I decided to make the liner in Flash Orange. The shoe laces and an extra pair came in Flash Green and Solar Yellow. I then had the option to add an embroidered name to the shoes. Simply add text using a 12 character limit. I went with – SportsTechie. Finally, there was an option to add the flag of a country to the outsole so Team USA it was. The sizing (Size Guide) was not universal and broke down men and women sizes in US, French, Japanese and UK measurements. It was a fairly routine web checkout. I was provided with a code for free customized cleats that surprisingly did not cover the cost of $12 in shipping fees. The subtotal price to purchase the Predator Instinct custom cleats was $250. There was an online monthly promotion going on that took off 20 percent of the custom mi adidas shoes and apparel. The first thing I noticed when opening the FedEx box was the fine looking folded up adidas bag that when unfolded displayed our company name, SportsTechie, stitched on the front side. The smell of recently manufactured shoes surrounded the new pair of cleats when I pulled them out of the box. Taking pictures of the cleats with my iPhone was fun to do. 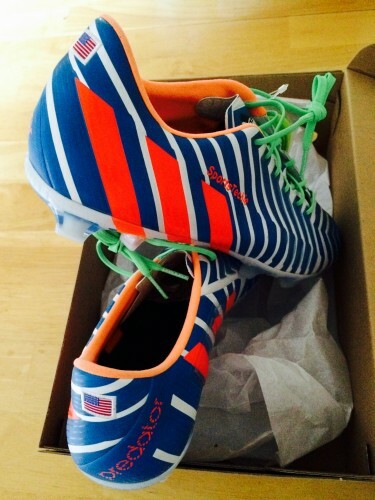 I stepped out back and kicked a Brazuca World Cup ball with the Predator Instinct cleats and felt like a professional. Sorry I do not own a selfie stick so action photos I played organized soccer as a kid through high school and some coed ball after that so this was not my first soccer ball rally. The cleats actually made it feel like a brand new experience. Maybe it was the pride of wearing a top of the line adidas world class cleat, or maybe it was all the tech that went into making these custom cleats, most likely it was a combination of the two meshing together for championship athletic performance shoes waiting to happen. To customize the cleats I used the adidas.com configurator. 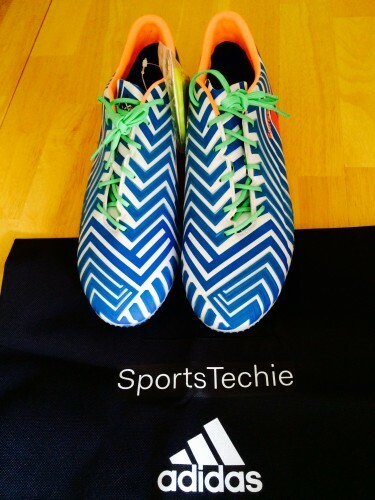 Sports Techie, adidas cleats are worn by football superstars, recreational athletes and exercising kids all over the world. As the humble curator of the #SportsTechie online community I have gratitude for the opportunity to review the Predator Instinct, the mi adidas customization process and cutting edge shoe technology. Paying over $200 for a custom cleat is what it is. Most players cannot afford this treat, however, those that can will enjoy the look and feel of this performance footwear. Nowadays, having a pair of durable soccer cleats is essential. I am excited to wear them in my next masters soccer or lacrosse match, maybe a super competitive adult kickball game will be the sport that helps me break them in. Wearing these Predator’s influences me to believe I am playing for FC Barcelona and my name is Messi, hopefully, developing a parallel skill set will follow. Viva Barca! Count me all in, mi adidas.